Atsuta Shrine is a Shinto shrine in Nagoya, Aichi Prefecture. In Japan, there are a number of shrines, Atsuta Shrine is one of the oldest shrines in it, is also one of the most sacred shrine. 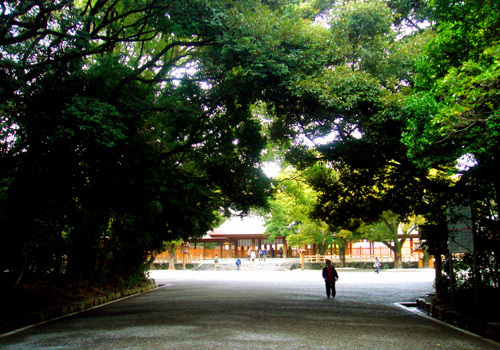 In Atsuta Shrine is enshrines the Kusanagi sword, one of the three sacred treasures. Three sacred treasures are treasures inherited by the emperor. In Japanese mythology, is a treasure from God bestowed on the Emperor. Consists of three sacred treasures of jewels and a sword and a mirror. The Atsuta Shrine has a sword. However, a very sacred treasure so that you can not actually see. The shrines are surrounded by vast forests, so you can feel the holy atmosphere. You can go to Atsuta Shrine by subway from Nagoya station.